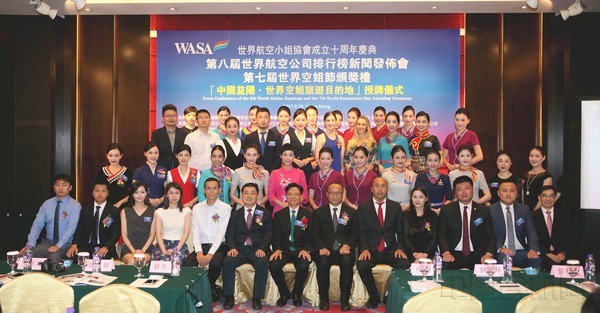 On September 15, “Press Conference of the 8th World Airline Ranking and the 7th World’s Stewardess’ Day Awarding Ceremony” was held in Hong Kong. The ceremony, sponsored by World Air Stewardess Association and Aviation Professional Committee of World Urban Cooperative Organization, totally published 15 ranking lists in terms of advantage study and assessment, including the World's Most Popular Airlines Ranking in 2017, Asia's Top 10 Featured Airlines Ranking in 2017, etc. According to 3 Class I indexes, 13 Class II indexes and 39 Class III indexes of “GN World’s Top 10 Stewardess Index System”, Son Solita, the stewardess of Lanmei Airlines (Cambodia) Co., Ltd., won the “World’s Top 10 Stewardess Award in 2017”.